any simultaneous combination of tones. the simultaneous combination of tones, especially when blended into chords pleasing to the ear; chordal structure, as distinguished from melody and rhythm. the science of the structure, relations, and practical combination of chords. Dad feels "harmony" is a word that sums up the spirit of the holidays. singing together - in 4-part harmony! 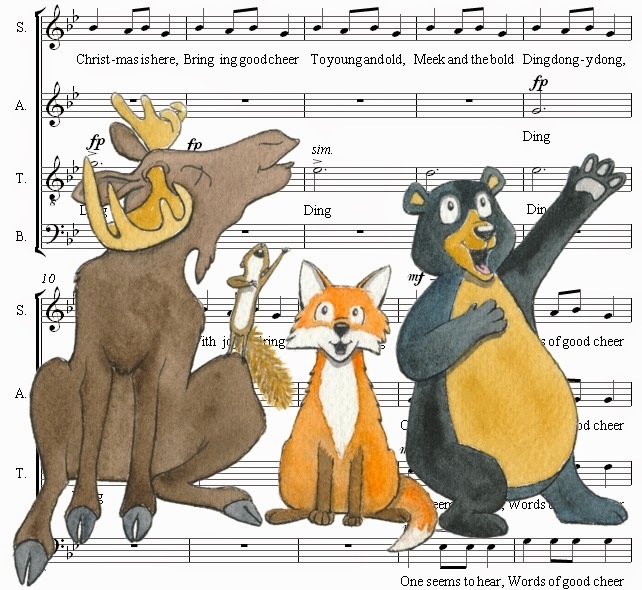 I found a favourite Christmas song - "Carol of the Bells"
I placed my illustration atop this sheet music and voila! "May your holiday season be harmonious!" Look around and see what you can do to lend some harmony to this festive season! Wishing you all the best - always!